Xiaomi announced its flagship device Xiaomi Mi4 today. the smartphone powered by Qualcomm Snapdragon 801 SoC clocked at 2.5GHz, 3GB RAM, sports 5-inch display and a sporting a metal frame. Specifications wise, the Xiaomi Mi4 has Qualcomm 801 quad-core processor clocked at 2.5 GHz paired with 3GB RAM, 16GB/ 64GB internal memory, 13-megapixel f/1.8 rear camere and 8-megapixel front shooter and powered by 3080 mAH battery. The smartphone sports 5-inch Full HD display (1920 x 1080 resolution) with 441 ppi pixel density, in addition the Xiaomi Mi4 has nano coating provides water-resistance feature. Xiaomi claims that the battery charges to 60% in an hour and fully charged in 2.5 hours. 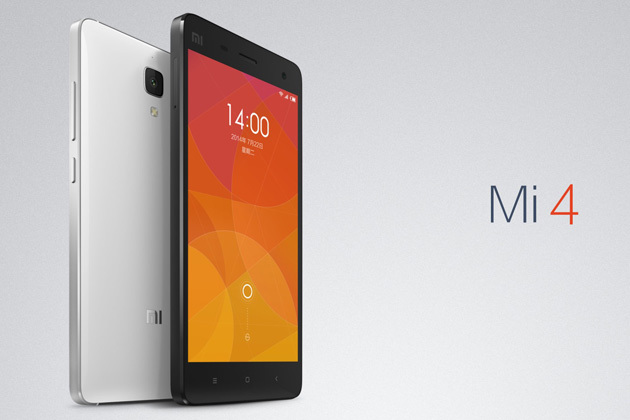 The Mi4 has stainless steel all-metal frame. Connectivty point of view the Mi4 supports LTE, dual band 802.11ac WiFi,and Wifi Direct, Blutooth, A-GPS and an infrared transmitter. Xiaomi has MIUI v5 on top of Android. Xiaomi Mi4 will come with customisable back cover and there will be a lot of options available including wooden, fabric, and leather back covers. The 16GB version of Xiaomi Mi 4 will cost just CN¥1,999 or about $322 (₹19390) for the 16GB version, and CN¥2,499 or about $402 (₹24,231)for the 64GB version.